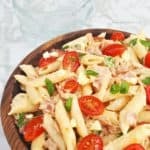 Quick White Cheddar and Bacon pasta is comfort food at it’s best ! 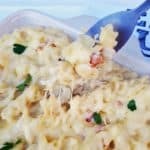 Loaded with a creamy cheese sauce and Bacon makes this a winner every time Pasta smothered in the creamiest cheese sauce, add bacon and a delicious comforting dinner is on your dining table in around 30 minutes ! 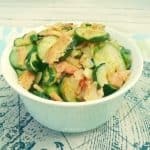 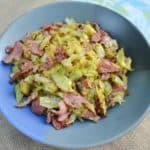 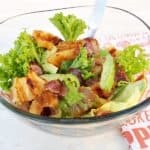 Fried Cabbage with Bacon is tasty and a very popular side dish which you can make at the last minute if needs be This is such a simple, yet most delicious recipe for Fried Cabbage and it makes the ideal side dish. 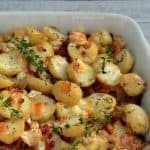 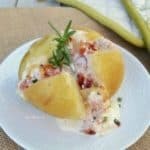 Creamy and loaded with Bacon, this Tartiflette (Potato based casserole) is one of my family’s favorite lunch or light dinner dishes With only a bit of prepping and dumping into an oven dish, you can have this Tartiflette on the dining table in no time at all. 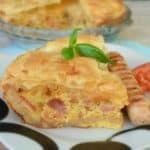 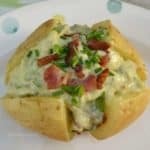 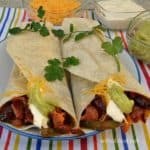 Bacon and Bean Burritos – a quick filling makes these burritos the perfect breakfast or light dinner for this time of year – not too rich, yet filling enough Bacon and Bean Burritos are the perfect dinner and these are so filling, not much else is needed on the side, except perhaps a crunchy salad.